Slot review of Juices Wild slot machine created by Open Bet developers with 30 lines and 5 reels. Juices Wild Slots has not been reviewed yet, be the first to rate this slot. 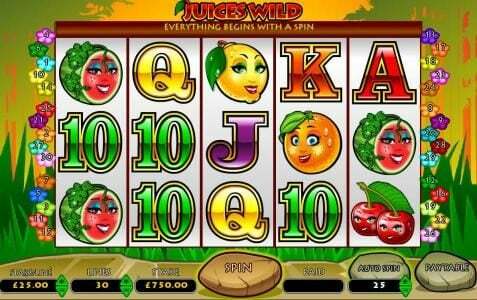 Juices Wild is a 5 reel, 30 payline fruit inspired video slot developed by OpenBet. 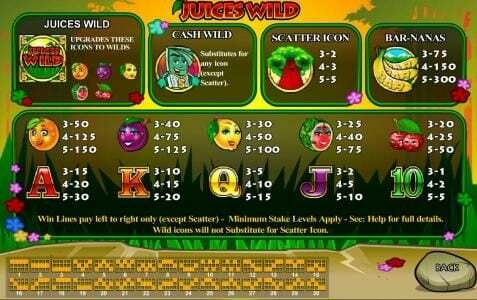 Juices Wild provides players with scatters, a substitute symbol and a jackpot win worth the maximum amount of $7,500. Fruit Slots are a predominate factor for a number of slot machines. Juices Wild beats all other fruit based slot machines with its stunning theme. Behind the reels you'll see grass plains where the fruit will grow. On the reels symbols include oranges, grapes, lemons, watermelon, cherries, themed poker symbols, a large tree and more. Juices Wild gives players the opportunity to make generous bets that can appeal to every type of Slot player. One coin can be wagered on each of the individual paylines that are available. As each coin has a value that can range from $0.01 to $25, it means that you have a betting range of $0.30 to $750 at your disposal when playing Juices Wild. This will be especially appealing to high rollers due to the maximum bet of $750. There are two separate wild symbols available in Juices Wild. The first wild is the games logo. This wild allows for you to turn any of the fruit symbols into a wild symbol and thus by allowing for the potential of more wins to be triggered. The second wild is the cash man. This wild acts as a regular substitute symbol would. It will take the place of a symbol that will help complete a winning combination. This therefore allows for you to land on a sequence of wins which in return means more money in your bankroll. Get your juices flowing and play Juices Wild today!